Close examination of wide-field, high resolution images of outbursting comet 17P/Holmes show a set of fragments which rapidly recede from the nucleus and fade. Astronomers from the University of California, Los Angeles and the University of Hawaii have discovered multiple fragments ejected during the largest cometary outburst ever witnessed. Rachel Stevenson, Jan Kleyna and David Jewitt began observing comet Holmes in October 2007 soon after it was reported that the small (3.6 km wide) body had brightened by a million times in less than a day. They continued observing for several weeks after the outburst using the Canada- France-Hawaii Telescope in Hawaii and watched as the dust cloud ejected by the comet grew to be larger than the Sun. The astronomers examined a sequence of images taken over nine nights in November 2007 using a digital filter that enhances sharp discontinuities within images. The filter, called a Laplacian filter, is particularly good at picking out faint small-scale features that would otherwise remain undetected against the bright background of the expanding comet. They found numerous small objects that moved radially away from the nucleus at speeds up to 125 m/s (280 mph). These objects were too bright to simply be bare rocks, but instead were more like mini-comets creating their own dust clouds as the ice sublimated from their surfaces. Caption: Animated movie showing the expansion of the coma of comet Holmes over 9 nights in 2007 November. The images have been spatially filtered to reveal fine structure. 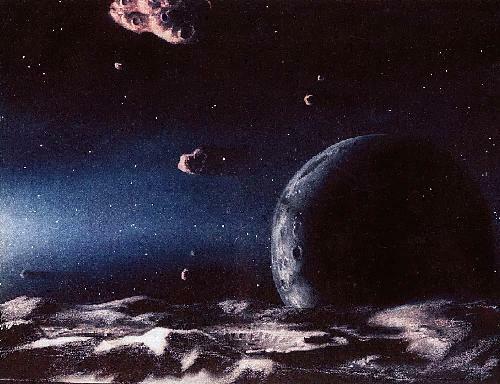 Inside the expanding envelope of the dust coma, a set of faint objects and their associated dust trails can be seen receding from the nucleus. Black/white circles that jump from image to image are background stars. While cometary outbursts are common, their causes are unknown. One possibility is that internal pressure built up as the comet moved closer to the Sun and sub-surface ices evaporated. The pressure eventually became too great and part of the surface broke away, releasing a huge cloud of dust and gas, as well as larger fragments. Surprisingly, the solid nucleus of comet Holmes survived the outburst and continued on its orbit, seemingly unperturbed. The orbit period of comet Holmes is about 6 years, putting it in the class of Jupiter Family Comets whose orbits are strongly influenced by Jupiter. These objects are thought to have spent most of the last 4.5 billion years orbiting the Sun beyond Neptune, in a region known as the Kuiper Belt. Holmes probably was deflected into its present orbit within the last few thousand years and is losing mass as it evaporates in the heat of the Sun. In another few thousand years it is likely either to hit the Sun or a planet, be ejected from the Solar system, or simply die by running out of gas. The comet is now moving away but will return to its closest approach to the Sun in 2014, when astronomers will examine it for signs of further outbursts. Caption: (Left) Image of comet Holmes from the 3.6-meter Canada-France-Hawaii telescope on Mauna Kea showing the large expanding dust coma. 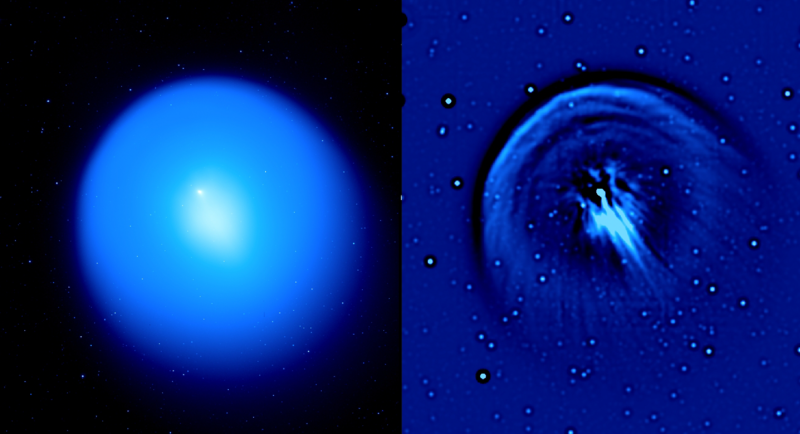 On the left, a 'raw' image is shown, in which the brightness reflects the distribution of dust in the coma of the comet (the nucleus is in the bright, point-like region to the upper left of center). On the right is shown the same image after application of the Laplacian spatial filter, to emphasize fine structures. The white/black circular objects are background stars enhanced by the Laplacian filter. Russian version of this page by Oleg Segal.